While it may seem like a small deal, a clogged drain is a household emergency requiring prompt attention. Why? Because if left unchecked, continued use can lead to a flood. Luckily, there are multiple ways of dealing with clogs before they become a problem, ranging from chemicals you can buy at the store to homemade remedies. Regardless of the method you choose, here’s how to unclog a drain, toilet, shower drain or a sink. Additionally we will explain in detail how to make your own homemade natural drain cleaner with a simple recipe using ingredients you already have at home. There are two basic routes when you’re looking for how to unclog a drain: by using chemicals, or by using an organic natural drain cleaner. When used in the right way, chemical drain cleaners are effective in unclogging drains. These cleaners can come in a solid form, or as a liquid form as alkaline or acidic solutions. An alkaline-based chemical drain opener contains sodium or potassium hydroxide. These types of drain openers are useful for unclogging drains blocked with grease or hair. Acidic chemical drain openers contain sulfuric acid and are effective in dissolving blockages in water pipes. These chemical drain openers react with water to release gasses which may be hazardous to human health. Inhaling such gasses may leave you at the risk of skin burn, visual loss, and respiratory problems. Some people have reported burning sensations after using chemical drain cleaners. Make sure you read and follow all instructions before using a chemical drain cleaner. Before you commit to chemicals, however, check out these easier (and safer) ways to remove clogs. There are different types of clogs — some are worse than others — so what you’re going to want to do is figure out a way that works for you. Generally speaking, you’re looking at four different ways of unclogging a drain: you can boil water, you can use a plunger, you can snake it, or you can make your own drain cleaner. Let’s take a look at each of these. The first option for clearing a drain is by using boiling water to open it. As long as the drain is relatively minor, this method should work. First, when your drain is slow, make sure that there isn’t any water in the pipe. Next, boil a pot of water and (carefully) pour directly into the drain to flush it. It should only take one, maybe two flushes to remove the blockage. Any more than that and the clog might require a different method. Next up we have a plunger. This useful tool has been clearing clogged drains for years. Nowadays you can buy small cup plungers, which are easy to use and relatively inexpensive. To use it, place the plunger over the clogged drain and plunge as hard as you can. Unlike with the technique with the boiling water, this time you DO want there to be water in the drain. The plunger is designed to pressurize the water and force it through the pipe, thereby clearing the clog. If there’s no water, then you’re just pushing air, and the clog will persist. 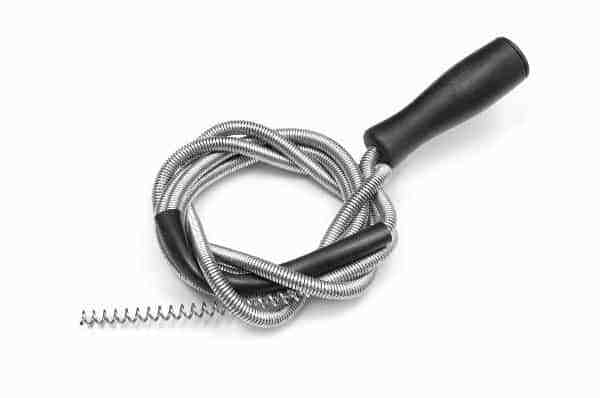 When boiling water and plungers don’t work, try using a drain auger (also called a drain snake). You’ll find drain snakes in most hardware stores. Some drain snakes are manual and some are electric. 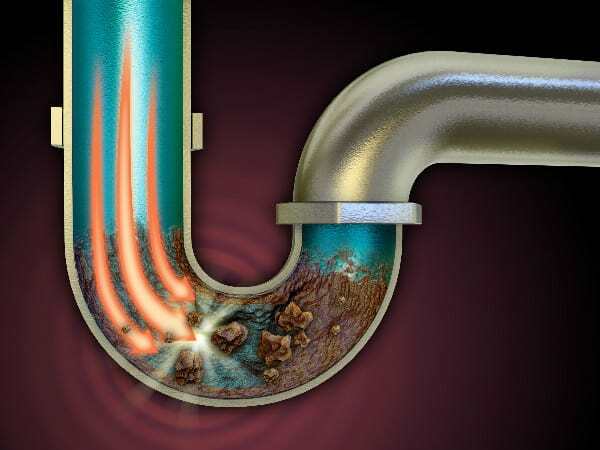 One advantage of using a drain snake is you get to reach blockages deep within the pipes. Put the end of the snake into the drain and twist the handle. Push the drain snake and find the blockage. Twist the snake until you the blockage frees. Verify that the blockage is gone by running water. To use a drain auger/drain snake, start by putting the rear end of the drain snake into the drain hole and twisting the handle. Next, you’ll want to push the drain snake further until you feel the blockage. Once located, turn the drain snake around until you feel the blockage free. You’ll be able to tell whether or not the drain is clear by running water for several minutes. If part of the blockage is still in place, the water will continue to drain slowly. Start by pouring a pot of boiling water into the drain. Pour the baking soda into the drain and let sit. Finish with 2 cups of vinegar and 1 cup hot water. Close/plug the drain and let sit for at least 20 minutes. Flush with another pot of boiling water. Store-bought cleaners contain dangerous chemicals and if you’d prefer to avoid using a chemical-based based drain opener, consider making your own homemade, natural drain cleaner from baking soda and vinegar. Start by pouring boiling water down your drain (that might be enough to clear it, but if not, keep reading). Pour the baking soda into the drain and let it sit for a few minutes, then pour the vinegar in with a cup of hot (not boiling) water. You’ll want to plug the drain at this point because there’s going to be a chemical reaction that you don’t want overflowing. Let the mixture sit for 15-20 minutes and then flush the drain with another pot of hot to finish the job. Ta-da! Your drain is clear. Are you battling with a clogged toilet? 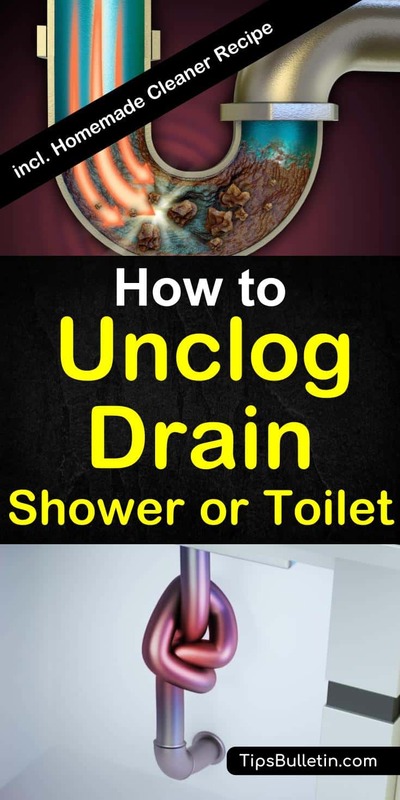 Here’s how you can unclog your toilet with ease. Depending on the nature of the substance that caused the toilet block, you can use an enzyme waste dissolver to get rid of the blockage. An enzyme waste dissolver only works on organic waste products. After pouring the stated amount in the toilet bowl, wait for a few hours or overnight so the mixture can take effect. A home remedy for a clogged drain made from baking soda and vinegar can also be used to unclog the toilet. It is the same combination we use for our homemade glass cleaner. Simply pour the mixture into the bowl and let it sit for a few hours before flushing. Drain snakes can be used to unclog a toilet following the same procedure used in unclogging a drain. If you do not have access to a drain snake, try using a wire coat hanger. Plungers are the perfect tool for clearing your clogged toilet. Put on protective gloves and coveralls before using a plunger. Opt for a more durable plunger and use it the same way you would when clearing the drain. Only use chemical drain openers as a measure of last resort. Be careful when using this product and do not use a plunger right after to prevent toxic substances from getting in contact with your skin or eyes. A wet/dry waterproof vacuum can be placed in the toilet bowl to remove the blockage. Remove the drain stopper with a screwdriver and check for the cause of the blockage. Use a plastic glove and flashlight to see and remove hair strands or other minimal particles causing the blockage. Screw on the drain stopper and use a plunger to clear the drain one final time. All these methods are useful in unclogging drains, sinks, shower drains, and toilet drains. 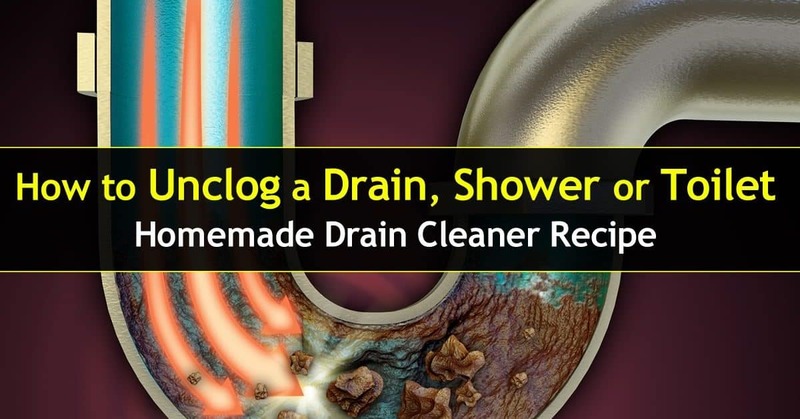 Rather than trying to figure out how to unclog a shower drain after the fact, however, it may save you time and effort to take steps to prevent drains from getting clogged in the first place. How? Avoid tossing garbage and items like hair, rice, gums, stickers, tampons, condoms, toys and other items into the kitchen or toilet drain. Occasionally lift off drain stoppers and clean debris laying in the shower drain. A simple very powerful DIY shower cleaner will work just fine. This will reduce the chance of having a clogged drain in the future. Always dispose all hair in the garbage bin and ensure to comb hair only after a shower. This will reduce the amount of hair that gets trapped in the shower drain. Sink strainers were meant for a reason. Use them. Before tossing that dish into the sink, strain the large bits away. Enzymes should often be used to clear organic waste that might cause a blockage. If you have pipes, sooner or later you’re going to have a clog. Luckily, having a clog doesn’t necessarily mean you have an emergency. Keep these tips in mind, and you’ll be able to handle whatever comes your way, be it a small clog or a major one. Know someone that struggles with clogs? Use the buttons below to share on Facebook, Twitter, and Pinterest.